Why not treat yourself and your loved ones to a quality haircut and luxury hot towel shave on the morning of your big day. Our packages have been designed to make your morning as relaxing as possible but also leave you looking your very best. Our fully equipped mobile barbershop can come to your home, hotel or ANYWHERE that’s convenient for you. Once the pre shave oil is applied we then use a hot towel to open the facial pores allowing for a truly close shave. 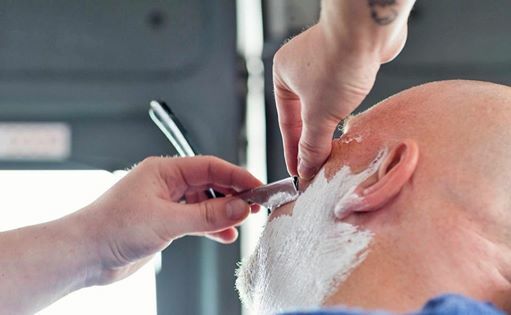 After the shave is finished we apply our cooling post shave balm and cold towel to leave your face feeling ultra smooth and fresh.To top it all of our highly trained masseur will massage your scalp leaving you feeling like your on cloud nine. We start by applying our pre shave oil and hot towel followed by an ultra close shave using a single blade razor. We then apply our cooling post shave balm and cold towel to leave your face feeling “kissably” smooth. After we finish your individually tailored haircut we then style your hair using our very own barbers2u wax. The beard trim is designed for those gents who are still wanting to keep a small amount of stubble on the day. All of our shaves are performed using only the best products. That’s why we use “BLUEBEARDS REVENGE SHAVING KITS” which were voted FHMs shaving product of the year 2013.